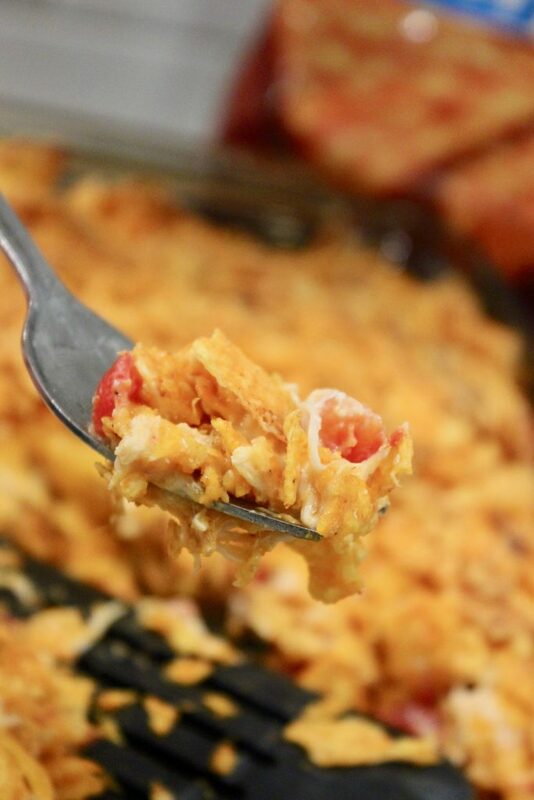 This Dorito casserole is layers of crushed Dorito tortilla chips, shredded chicken, Rotel, sour cream and cheese, all baked together to golden brown perfection. This is an easy dinner option that the whole family will love! In fact, after making this, my family all separately mentioned how good this dinner really was, with both my husband and eleven year old saying how this has to go in the regular dinner rotation. If you’re after an easy dinner that will be a hit with everyone, this Dorito casserole recipe is the one you’ll want to be making. I don’t usually wait until the last minute to make dinner, but when I do, everyone is ravenous and frustrated because they’re all hangry beyond belief, myself included. But in a weird twisted way, I love that they all gather in the kitchen at the countertop waiting for the timer to go off signaling that dinner’s ready. 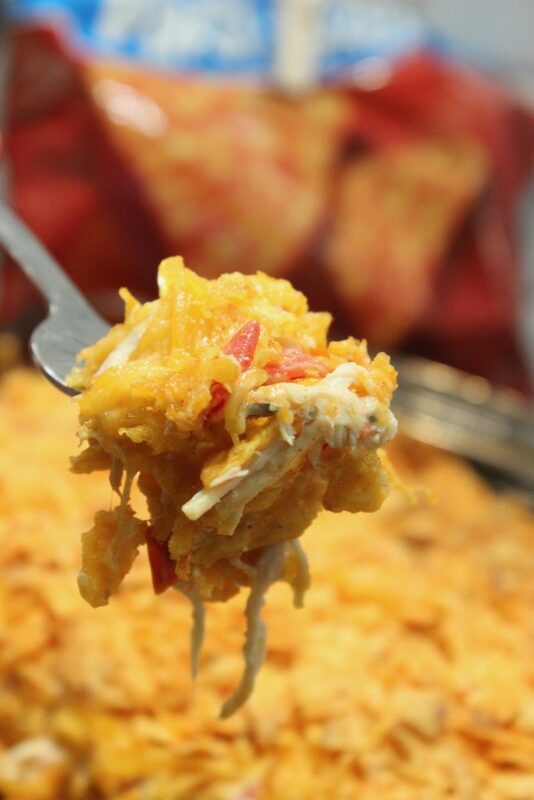 Enough chatting, onto this recipe for Dorito casserole, right? 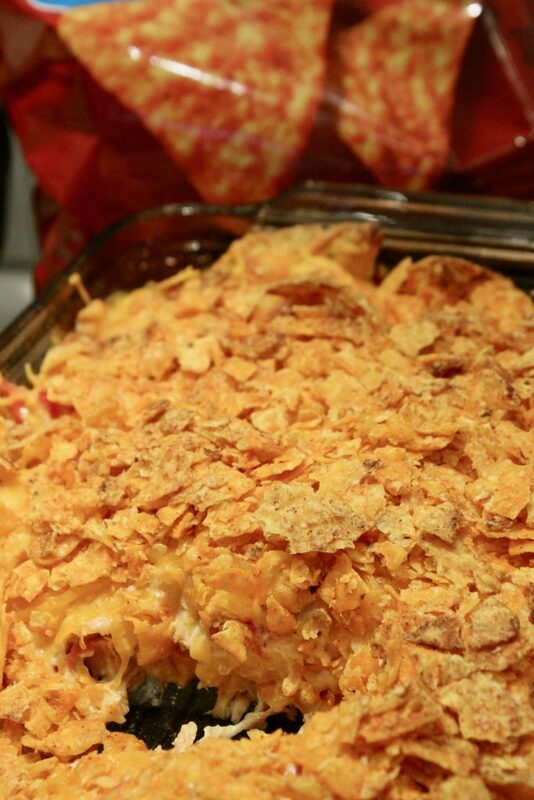 This Dorito taco bake is about as easy as they come. In fact, you’ll use shredded chicken that’s already been cooked as the meat of the casserole, which I love. I already had two cups of shredded chicken in the freezer prepared so that’s how I ended up putting this Dorito taco bake on my menu in the first place. I do have three shredded chicken recipes that are perfect for making bulk chicken ahead and storing in your freezer. Two are Instant Pot shredded chicken recipes and one is the recipe that I use to make shredded chicken in the crock pot. I’ll be honest, making chicken ahead is key in making sure that it’s not another expensive takeout night for dinner. If you have chicken ready to go in the freezer, you have so many dinner options: Buffalo chicken dip, quesadillas, tacos, and the list goes on and on. 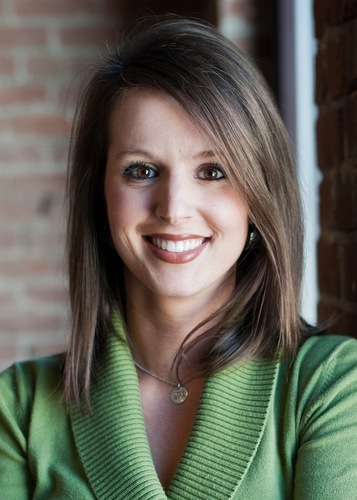 The Dorito casserole with crescent rolls tastes mare like a taco salad to me … maybe because the crescent rolls are a little like a taco salad shell and the seasoned ground beef is what I generally top taco salads with? Not sure, but that’s neither here nor there – making both is what I recommend! OK, on and on I go. Here’s how to assemble this Doritos taco bake. So, I mentioned that on the night that I was planning on taking pictures of this Chicken Dorito Casserole, I was in such a hurry that I didn’t take in process photos (hey, just being real) 🙂 So, you’ll have to imagine with me as I type the process while whipping up this taco casserole with Doritos. But, for real, it’s so easy and simple that you just can’t even mess this one up. Preheat your oven to 350 degrees. While that’s heating up, grab a mixing bowl (the perfect size is the largest Tupperware bowl) like this size. In your big mixing bowl combine the chicken, cheese, sour cream, taco seasoning, Rotel, and cream of chicken soup. Mix that up really well so all of the flavors are combined. ** If you don’t like cream of chicken soup you could use cream of mushroom soup instead. Now, you’ll start the layers. Finally: Bake for 25 minutes at 350 degrees and enjoy! That’s it, guys! That’s literally the way to have the very best Mexican Casserole with Doritos! 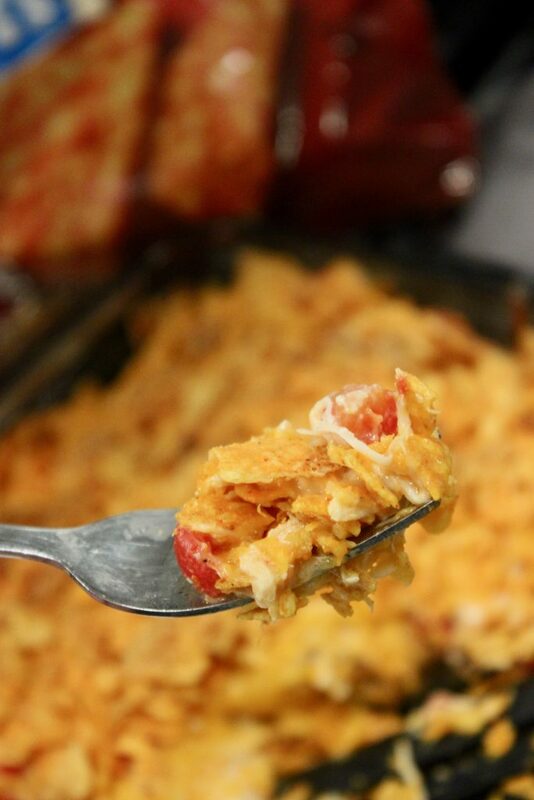 To my family, there’s nothing more awesome than Doritos recipes made into a casserole. 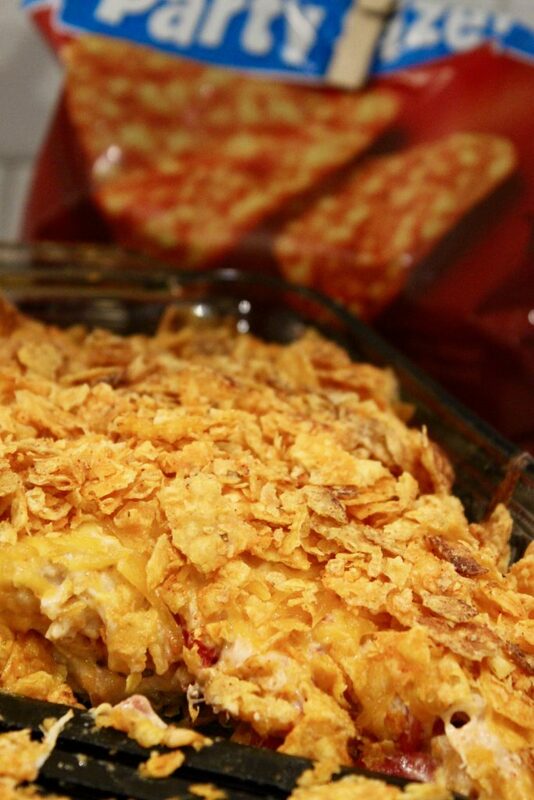 And, this Dorito casserole, chicken as the star takes the cake! 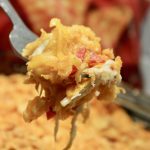 Dorito casserole - Chicken though instead of beef ... otherwise known as Cheesy Chicken Dorito casserole -- This will be a HUGE hit with everyone in your family. 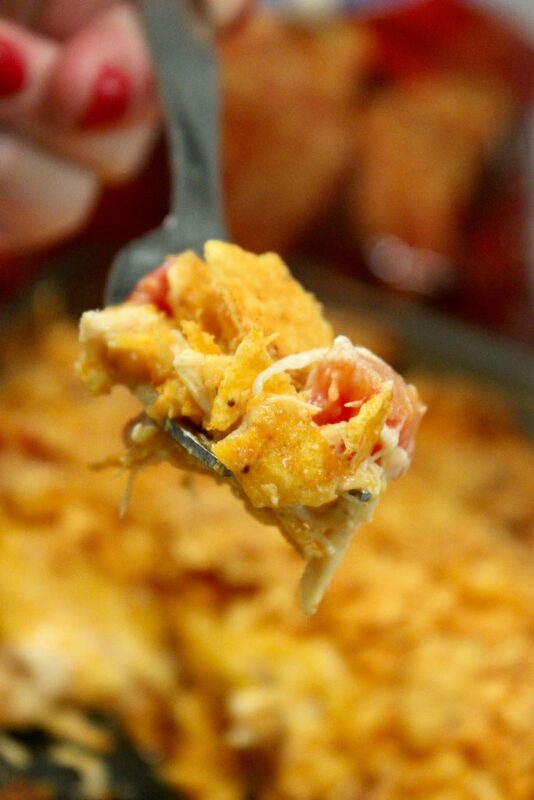 This Chicken Dorito Casserole Recipe is one that you could even serve for dinner when the kids have friends over - and this is even potluck material. 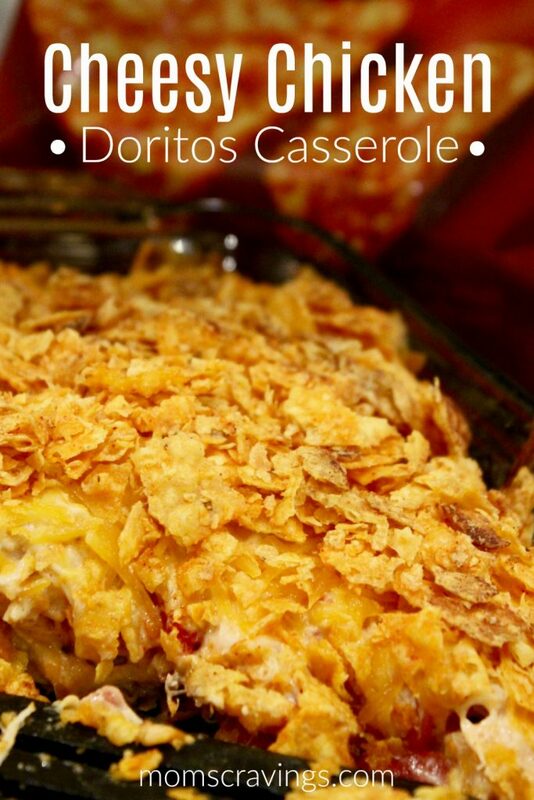 Everyone loves this Doritos casserole! In a mixing bowl combine the chicken, cheese, sour cream, taco seasoning, Rotel, and cream of chicken soup. Mix that up really well so all of the flavors are combined.